One of my fave artists (she made my custom Shepard portrait) is helping me become a better artist and has been sending me really helpful tips and exercises to do that will help me relearn how to draw while dealing with arthritis (it’s been really hard on my hands). Her name is Cheyenne and she’s wonderful (you can find her work on Tumblr and her words over on Twitter). First step: gesture drawings to focus on how my hand moves. 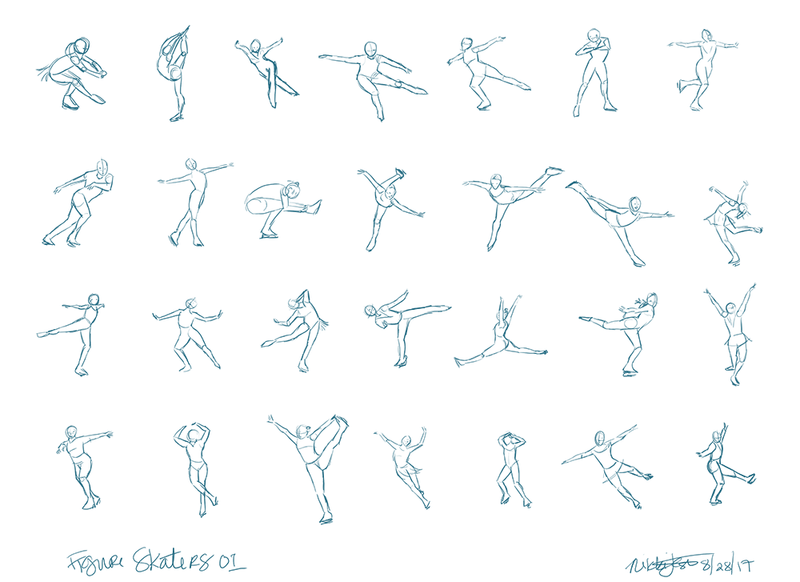 Since I can’t stop watching Yuri On Ice (I’m watching it for the fifth time now), all my gestures are based on figure skating poses. These are each quick 30 seconds sketches to loosen up my pen flow. I’m still pretty slow and rigid, but I’m getting there and it means a lot to have the guidance of an artist I admire so much. I’ll keep getting better every time I draw. One sketch at a time!